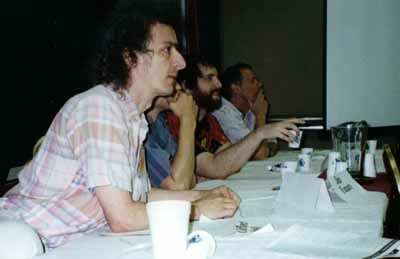 The Consortium held its official formation meeting and brainstorming session on June 30-July 2, 1995 in Soquel, California. The form of the organization and its goals were set down and founding members inducted. Using our background with the SolSys Sim MUD, created by Dr. Reed Riner of Northern Arizona University for six years as a learning tool, we looked into the future, when many two and three dimensional graphical worlds for social interaction have been up on the Net. We considered many technical and social aspects and considered emerging culture and community within these digital spaces. An important output of the brainstorming session was the visual SolSys white paper. This seminal document set the framework for much of what we now see emerging. The following key topic areas were discussed. See the white paper for more details. Applications in Business: is the Real Virtual Conference Room Coming? Applications in Entertainment: is networked DOOM the only model we have? Digital Communities and Culture: What makes a community work? What is Good and and what is Bad behaviour in digital space? how important is facial expression, body movement and gestures? 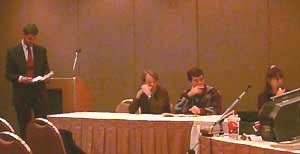 Sessions were held on virtual avatar worlds, artificial life, and alien contact. Our thanks go out to Worlds Incorporated and Russell Freeland. Description: the Consortium presented a demonstration of Internet-based 3D worlds wherein people choose a digital avatar and fly around in the space, interacting through text or voice. We showed AlphaWorld, where there is a series of cities under construction including over 200 blocks of buildings, gardens and roads which have been put up since August of 1995. The Consortium discussed its recently initiated Sherwood Forest community which is designed to experiment with Cultural Contact made in Digital Space. AlphaWorld has 25,000 registered citizens and is a significant experiement in virtual community which builds on some of the experiences in MUDs and MOOs. The panelists considered the cultural limitations and possibilities of this new medium and its impact on humanity. The audience had extensive interaction with the panel on these issues. We hoped that this symposium might stimulate interest in the CONTACT community for another Bateson/COTI project. Description: this young team of innovative world builders showed their latest VRML (Virtual Reality Modeling Language) worlds, including a virtual convention built for Nippon Telephone and Telegraph. 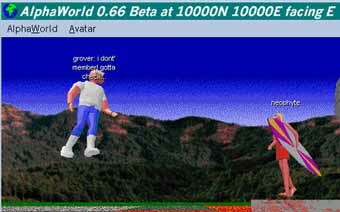 This was the first VRML world which had avatars and behaviour. Wide acceptance of VRML will enable and explosion of 3D world servers to flood the internet just as 2D Web servers have in the past 2 years. This presentation was open for the audience to ask *how to* questions on building worlds in this new medium. We hoped this would be the first in a series of get-togethers, demonstrations and brainstorming sessions the Consortium can create to help in the birth of this new form of CONTACT! We presented a formal demonstration at the ACM SIGCHI CHI96 conference in Vancouver in April titled: Inhabited Digital Spaces. This will be the first time technologies like AlphaWorld have been seen at a major academic conference.